This article was written by Akanksha, a student of Amity Law School, Delhi(Former Research Associate). “nullum crimen sine iniuri”, which means no person shall be punished for an act which is not harmful to anybody, is a legal maxim forming the basis of criminal law. The legislators who framed The Muslim Women (Protection of Rights on Marriage) Bill have not taken into consideration the above maxim. Section 3 of the bill recognises the judgment of supreme court in the case of Shayara Bano v. Union of India and in section 4 it goes to the extent of declaring triple talaq a crime with punishment of imprisonment of 3 years. By the end we will be able to understand how these two sections are conflicting in nature. Triple talaq or talaq-e-bidat is one of the many ways used for the annulment of the marriage by a muslim man. As the name suggests, it involves the pronouncement of Talaq three times by the husband which results in the invalidation of marriage. This hasty and cruel form of ending the marriage has been the topic for debate for quite a while now. In 1975, Shah Banu Begum from indore was thrown out of her matrimonial home by her husband for which she approached the court to get maintenance under section 125 of CrPC. The court ordered that maintenance be given to Shah Banu and that section 125 is applicable to everyone regardless of their religion, which was followed by a lot of criticism. This resulted in the enactment of Muslim Women (Protection of Rights on Divorce) Act by Rajiv Gandhi in which triple talaq was allowed to be given by muslim men instantly and unilaterally even over email, WhatsApp ,Skype or SMS. The courts have shown disregard towards this arbitrary and cruel practice in various judgements. In Shamim Ara vs State Of UP & Anr, the Supreme Court said it was imperative to moderate the arbitrary nature of triple talaq. In Dilshad Begaum Ahmadkhan Pathan vs Ahmadkhan Hanifkhan Pathan And Another, the Bombay High Court ruled that arbitrary pronouncement of triple talaq wasn’t a sufficient condition for divorce. A 14-member committee constituted by the UPA government in 2012 recommended a ban on oral, unilateral and triple talaq, as well as on polygamy. 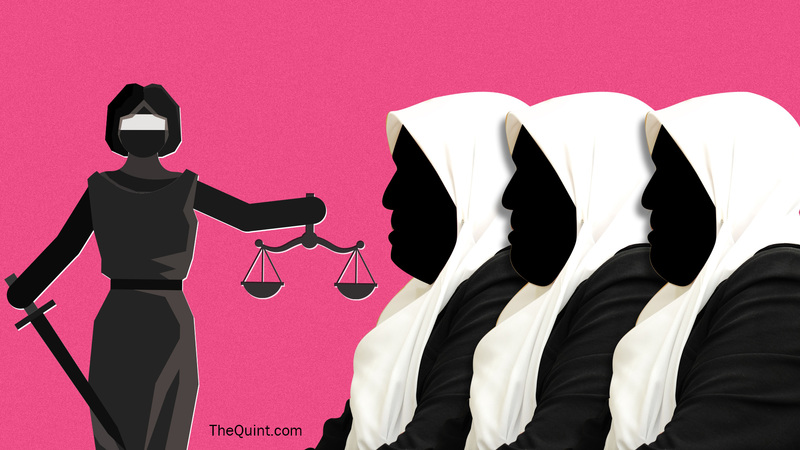 In its report submitted to the government in 2015, the Committee said triple talaq made wives extremely vulnerable and insecure regarding their marital status. Finally in August 2017, in the case of Shayara Banu v. Union of India, four women won the case in the supreme court in which the court, with 3:2 majority proved the practice of triple talaq unconstitutional and invalid. Three months after this judgement the legislation has proposed The Muslim Women (Protection of Rights on Marriage) Bill which, as aforementioned, makes triple talaq a criminal offence and punishes anyone who utters these words with an imprisonment of 3 years. If we try to closely scrutinize the supreme court’s judgement, it would be clear that by making triple talaq invalid and unconstitutional, it takes away its legal validity. In layman’s language it can be said that now if a person says ‘talaq talaq talaq’, it will have no effect on the marriage. From various cases it had been observed by the courts that in most of the cases of ending the marriage by triple talaq, the muslim men out of anger and rage would do the pronouncement and would later regret. This judgement by the supreme court comes as a relief in such cases as even if these words are pronounced, it would have no validity and the marriage would remain intact. However, the legislators of the bill have failed to understand the spirit of the judgement. Now that triple talaq is a crime with 3 years of imprisonment as it’s punishment, a muslim man as soon as says ‘talaq talaq talaq’, though his marriage remains intact however he will go to the jail for 3 years, which completely defeats the entire purpose of the judgement, which was in the form of a remedy for the muslim women. This would in turn result in taking away the social and financial security for the women, making the objectives of the bill questionable. Apart from this ,there are innumerable flaws in the proposed bill. To begin with, the Narendra Modi government’s proposal to punish triple talaq needs closer scrutiny on the touchstone of the first principles of criminal law. A crime is a violation of a general legal right which, if not controlled, will endanger peace and stability of society and therefore it is the state which prosecutes the accused and punishes the convict on behalf of entire society. But then every harm cannot become ‘crime’. The harm needs to be real, unavoidable and serious and thus human behaviour which is merely offensive cannot be necessarily declared as ‘criminal act.’ Triple talaq which does not dissolve marriage is not such a harm which can be declared as a crime. There is a divide in the opinion of the community as well regarding the criminalisation of triple talaq. There is no better example of this than the sharply contrasting positions of the Bharatiya Muslim Mahila Andolan (BMMA), an all-India organisation of Muslim women, and the Bebaak Collective, an umbrella body of Muslim women’s groups across the country. Both these groups had united after the judgement of supreme court however there has been a divide in their opinion regarding criminalisation. While BMMA believe that criminalization is a necessary measure for deterrence, the latter has denounced it as “a vicious ploy of the BJP government to criminalise Muslim men”. BMMA argues that since marriage is a civil contract, the procedures to be followed on its breakdown should also be of civil nature only and favours “civil redress mechanisms and restorative justice to ensure that Muslim women are able to negotiate for their rights both within and outside of the marriage”. The organisation says this would render a woman more vulnerable, as with her husband in jail, she will be deprived of both financial security and of her right to stay at her matrimonial home. Also, no muslim organisation was consulted before drafting the bill and is thus has no conformity with the Quran and Constitution. The punishment for 3 years has no legal basis. Also we can say that it starkly contradicts the judgement of supreme court, because if talaq is made a crime, it in turn shows that triple talaq has a legal effect i.e. its pronouncement leads to the dissolution of marriage, which violates the judgement, as the judgement made the triple talaq invalid and its pronouncement no consequences. I would like to conclude by suggesting that the government instead of penalising men should first try to create legal awareness among Muslim men. It can also use the services of the All India Muslim Personal Law Board for this. Also the people need to believe that the real objective of the act is to protect muslim women and not just penalize muslim men, which can be achieved if the utterance of “talaq talaq talaq” would amount to domestic violence under Protection of Women from Domestic Violence Act (PWDVA). The bill is under scrutiny in the Parliament and the entire muslim community can not do anything except for hoping that some amendments are proposed in the bill so as to make it consistent with the Supreme Court’s judgement and Quran.